Remember the days of broad-market blockbuster launches? Then you must be getting old. 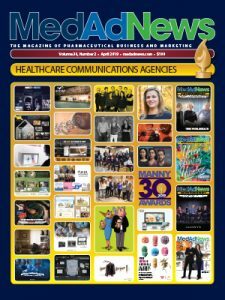 Just like the new compounds that launched in 2013 and 2014, the top sellers among the NMEs introduced in the United States during 2015 are all specialty drugs. In fact, of the top ten 2016 revenue producers from the new compound class of 2015, only one – Otsuka Pharmaceutical and Lundbeck’s atypical antipsychotic Rexulti – might not be called a specialty medicine (depending, of course, on who you ask). And while the numbers are not as spectacular as Sovaldi’s or Harvoni’s, three members of the new compound class of 2015 earned more than a billion dollars in sales in their first full year on the market, with Pfizer’s Ibrance generating more than $2 billion. Unlike Sovaldi and Harvoni, though, these three continue to grow. First approved on an accelerated basis in February 2015, Pfizer’s breast cancer drug Ibrance earned $723 million in revenue that year and an impressive $2.14 billion in 2016, making it the leader of the new compound Class of 2015 and the largest single brand source of revenue growth in Pfizer’s entire portfolio. According to a report by the market research company Statista, Ibrance will be the seventh highest-selling oncology drug in the world by 2020, with projected sales that year of $4.7 billion. In February 2016 FDA approved a supplemental NDA expanding the use of Ibrance 125 milligram capsules to include the treatment of hormone receptor-positive, HER2- advanced or metastatic breast cancer in combination with fulvestrant in women with disease progression following endocrine therapy. Then, in April 2016, Pfizer announced positive top-line results from the Phase III PALOMA-2 trial for Ibrance. The study met its primary endpoint by demonstrating an improvement in progression-free survival for the combination of Ibrance plus letrozole compared with letrozole plus placebo in post-menopausal women with estrogen receptor-positive, human epidermal growth factor receptor 2-negative (HER2-) advanced or metastatic breast cancer who had not received previous systemic treatment for their advanced disease. This provided confirmatory evidence for Ibrance in combination with letrozole in the first-line setting, which was first studied in the Phase II PALOMA-1 trial. Final results were presented by the company in June 2016. In November, the European Commission approved Ibrance for the treatment of women with hormone receptor-positive, human epidermal growth factor receptor 2-negative (HR+/HER2-) locally advanced or metastatic breast cancer. The approval was for Ibrance to be used in combination with an aromatase inhibitor. The approval also covers the use of the product in combination with fulvestrant in women who have received prior endocrine therapy. Ibrance is the first medicine to be approved in Europe that works by inhibiting cyclin-dependent kinases 4 and 6 (CDK 4/6). It also is the first new medicine approved for the treatment of women with this type of metastatic breast cancer in the first-line setting in nearly 10 years. Women with HR+/HER2- metastatic breast cancer represent about 60 percent of all metastatic breast cancer cases. The EC approval was based on a robust submission package including results from the Phase II PALOMA-1 trial in postmenopausal women with estrogen receptor-positive (ER+)/HER2- metastatic breast cancer who had not received prior systemic therapy for their advanced disease; the Phase III PALOMA-2 trial in the same population; and the Phase III PALOMA-3 trial in women with HR+/HER2- metastatic breast cancer who had progressed on prior endocrine therapy. All three randomized trials demonstrated that Ibrance in combination with an endocrine therapy significantly prolonged progression-free survival (PFS) compared to endocrine therapy alone or endocrine therapy with placebo. In December, Pfizer announced results from a sub-analysis studying Asian patients from the Phase III PALOMA-2 trial of Ibrance, in combination with letrozole, as first-line therapy for postmenopausal women with estrogen receptor-positive, human epidermal growth factor receptor 2-negative (ER+, HER2-) metastatic breast cancer. Results showed the combination of Ibrance and letrozole significantly extended PFS by more than 11 months compared with letrozole plus placebo, and demonstrated that the median PFS exceeded two years in these patients. In this sub-analysis of the PALOMA-2 trial, investigator-assessed median PFS for Asian women treated with Ibrance plus letrozole was 25.7 months compared with 13.9 months for women treated with letrozole plus placebo. The Phase III PALOMA-2 trial evaluated the use of Ibrance in combination with letrozole in the first-line setting, which was first studied in the randomized Phase III PALOMA-1 trial, and the results reinforce the clinical benefit of Ibrance in this treatment setting. The findings of this PALOMA-2 sub-analysis evaluating the efficacy and safety in Asian women were consistent with the overall findings of PALOMA-2. In March, FDA approved a supplemental NDA for Ibrance based on the results from the confirmatory Phase III trial PALOMA-2. The FDA action converted the original accelerated approval of Ibrance to regular approval and broadened the range of anti-hormonal therapy that may be administered with Ibrance. Ibrance now is indicated in combination with an aromatase inhibitor, expanding on its earlier indication in combination with letrozole, as initial endocrine based therapy in postmenopausal women with hormone receptor-positive (HR+), human epidermal growth factor receptor 2-negative (HER2-) advanced or metastatic breast cancer. Ibrance was the first CDK 4/6 inhibitor approved by FDA. As of March, Ibrance plus letrozole was the most prescribed FDA-approved oral combination treatment for HR+, HER2- metastatic breast cancer. The updated label was based on data including results from the Phase III PALOMA-2 trial, which evaluated Ibrance as first-line therapy in combination with letrozole for postmenopausal women with estrogen receptor-positive (ER+), HER2- metastatic breast cancer. PALOMA-2 demonstrated that the combination of Ibrance and letrozole significantly extended PFS, or the amount of time before tumor growth, compared with letrozole plus placebo. The median PFS of the Ibrance and letrozole combination exceeded two years – making it the first treatment for this population of women to do so in a Phase III study. The median PFS for women treated with Ibrance plus letrozole exceeded the median PFS for placebo plus letrozole by more than 10 months (24.8 months vs. 14.5 months for women treated with letrozole plus placebo), and represented a 42 percent reduction in the risk of disease progression. Ibrance is the only treatment for HR+, HER2- metastatic breast cancer with two category 1 recommendations from the National Comprehensive Care Network. On March 13, the NCCN updated its recommendation for Ibrance plus letrozole as a first-line treatment for postmenopausal women with HR+, HER2- metastatic breast cancer to a category 1 recommendation. In addition, Ibrance plus fulvestrant is recommended (category 1) for postmenopausal women with HR+, HER2- metastatic breast cancer who have progressed on endocrine therapy or premenopausal women receiving a luteinizing hormone-releasing hormone (LHRH) agonist. Note: Ibrance was launched in February 2015. Gilead’s HIV combination treatment Genvoya is only the latest entry in the company’s long history of dominance in the field. The compound, a combination of elvitegravir, cobicistat, emtricitabine and tenofovir alafenamide, was first approved by FDA in November 2015 and earned $1.48 billion in sales for Gilead in 2016. Genvoya passed that amount within the first half of 2o17, with Q1 sales of $769 million (beating a Bloomberg average of analyst estimates of $645 million) and Q2 sales of $857 million already in the books. In Q1 2017, Genvoya passed Truvada, the world’s leading HIV brand by revenue in 2015, to become the top-selling HIV product in Gilead’s portfolio. Genvoya is indicated as a complete regimen for treating HIV-1 infection in adults and pediatric patients 12 years of age and older who have no antiretroviral treatment history or to replace the current antiretroviral regimen in those who are virologically suppressed (HIV-1 RNA levels less than 50 copies/mL) on a stable antiretroviral regimen for at least six months with no history of treatment failure and no known resistance to the components of Genvoya. In February, Gilead announced 144-week data from two Phase III studies (Studies 104 and 111) evaluating the safety and efficacy of Genvoya for the treatment of HIV-1 infection in treatment-naïve adults. Through Week 144, Genvoya demonstrated significantly higher rates of virologic suppression compared to Gilead’s Stribild, based on the percentage of patients with HIV-1 RNA levels less than 50 copies/mL. Patients receiving Genvoya also demonstrated favorable renal and bone laboratory parameters compared to those treated with Stribild. In the combined analysis of Studies 104 and 111, a total of 1,733 treatment-naïve adults with HIV were randomized to receive either Genvoya or Stribild. At Week 144, 84.2 percent of patients taking Genvoya and 80 percent of patients taking Stribild achieved HIV-1 RNA levels less than 50 copies/mL. Additionally, at Week 144, 81.1 percent of patients taking Genvoya and 75.8 percent of patients taking Stribild achieved HIV-1 RNA levels less than 20 copies/mL, a secondary endpoint. At Week 144, virologic failure was similar between groups (Genvoya, 4.6 percent; Stribild, 3.9 percent); the difference in overall results was driven by fewer discontinuations on Genvoya due to adverse events or other reasons not related to efficacy (Genvoya, 11.2 percent; Stribild, 16 percent). There were statistically significant fewer adverse events leading to discontinuation in the Genvoya arm compared to the Stribild arm (Genvoya, 1.3 percent; Stribild, 3.3 percent). A separate analysis investigated the effect of the two regimens on laboratory parameters of kidney, bone, and plasma lipid levels. To examine kidney function, specific protein markers of glomerular and tubular function were examined, all of which favored Genvoya. This included a statistically significant difference in the median change in estimated glomerular filtration rate (eGFR) from baseline to Week 144 (Genvoya, -1.6 mL/min; Stribild, -7.7 mL/min). There were no cases of renal tubulopathy in the Genvoya arm and four cases in the Stribild arm. No participants on Genvoya had renal-related discontinuations compared to 12 participants in the Stribild arm. The analysis also found that decreases in bone mineral density were significantly less in the Genvoya group versus the Stribild group for both lumbar spine and total hip (spine: Genvoya, -0.92 percent; Stribild, -2.95 percent; hip: Genvoya, -0.75 percent; Stribild, -3.36 percent). The long-term clinical significance of changes in eGFR and BMD is not known. Additionally, patients on Genvoya had statistically higher increases in total, LDL and HDL cholesterol from baseline to Week 144 compared to patients on Stribild. There was no significant difference in the total cholesterol-to-HDL ratio at Week 144, nor any difference in the rate of initiation of lipid-modifying agents. Note: Genvoya was launched in November 2015. Novartis’ autoimmune disease medicine Cosentyx, first approved by FDA in January 2015 for the treatment of plaque psoriasis and then approved one year later for the treatment of ankylosing spondylitis and psoriatic arthritis, has quickly made its company a contender in the immunology field. By Q1 2016 the drug was the revenue leader in Novartis’ immunology portfolio, and by the end of its first full year on the U.S. market it was already a blockbuster, with $1.13 billion in global sales. Cosentyx also earned Novartis the 2016 Prix Galien USA Award for Best Biotechnology Product, and the drug’s $900 million in sales in the first half of 2017 suggest that it is not done growing. Cosentyx is the only IL-17A inhibitor approved in psoriasis, PsA and AS, with more than 80,000 patients treated in the post-marketing setting worldwide across all indications as of June 2017. In June, Novartis announced data showing Cosentyx shows sustained improvements in the signs and symptoms for active ankylosing spondylitis at three years, consistent with previous findings in active psoriatic arthritis at three years. New data also show Cosentyx provides rapid and sustained pain relief in patients with active PsA out to two years. 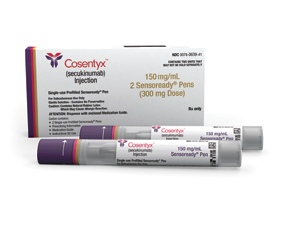 Cosentyx is the only fully human interleukin-17A (IL-17A) inhibitor to demonstrate 3-year efficacy and safety in Phase III studies of both AS and PsA. Cosentyx is also used to treat moderate-to-severe psoriasis, which is significant as up to 8 in 10 patients with PsA also have psoriasis. In the MEASURE 1 extension study, 80 percent of AS patients consistently achieved an ASAS 20 response (Assessment of Spondyloarthritis International Society response criteria) at three years. This was consistent with previous findings from the FUTURE 1 study in active PsA where Cosentyx demonstrated sustained improvements in the signs and symptoms of disease in about 80 percent of patients at three years as measured by ACR 20 response (American College of Rheumatology response criteria). A 2-year post-hoc analysis of the FUTURE 2 study evaluated Cosentyx in PsA, where almost every patient (99 percent) reported moderate-to-extreme pain or discomfort before initiating treatment. By Week 3, half of those (50 percent) treated with Cosentyx reported clinically meaningful improvements in pain of more than 20 percent, as measured by Visual Analogue Scale (VAS). At Week 4, the proportion of patients reporting no pain or discomfort was greater for Cosentyx (15 percent) than for placebo (5 percent) and this increased through to Week 104 (28 percent). Cosentyx continues to have a favorable safety profile, consistent with that shown in Phase III studies. In July, the European Committee for Medicinal Products for Human Use approved a label update for Cosentyx. The label update includes 52-week data from the CLEAR study demonstrating the long-term superiority of Cosentyx versus Stelara in psoriasis. The updated label also includes use of Cosentyx to treat moderate-to-severe scalp psoriasis – one of the most difficult-to-treat forms of psoriasis. The 52-week CLEAR study data show that Cosentyx is superior to Stelara in delivering long-lasting clear or almost clear skin over one year of treatment in adults with moderate-to-severe psoriasis. Cosentyx remained consistently superior to Stelara in achieving and sustaining a PASI 90 response (76 percent versus 61 percent) and significantly better in achieving a PASI 100 (clear skin) response (46 percent versus 36 percent) at Week 52. Note: Cosentyx was launched in February 2015.